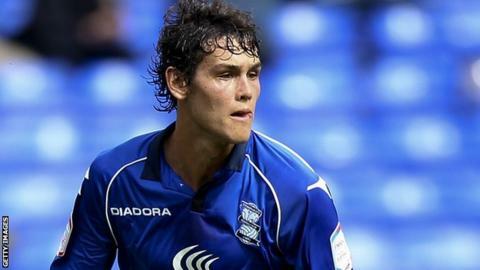 Birmingham boss Lee Clark has told defenders Will Packwood and Amari'i Bell to take advantage of Mitch Hancox and David Murphy's knee injuries. Packwood, 20, was recalled from his loan spell at Bristol Rovers and Bell, 18, returned from Nuneaton Town. Hancox is out until January, while Murphy is not expected to be fit until late February at the earliest. "It's a good opportunity for these youngsters over the festive period when there are lots of games," Clark said. "I proved last season and proved it this season that young players who come in and do well stay in the team ahead of senior players." It is not just injury cover that Clark needs, with both Dan Burns and Paul Robinson only two yellow cards away from suspensions. "Dan is on three yellows now and with five he gets a game ban - as a defender, you pick up cards unfortunately," Clark told BBC WM. "Paul is on eight cards and two more and he goes for two games. That is another reason that we have brought these young players back. "I take it as a positive - I use it as a galvanising effect for young players to say 'listen, there are possibilities for you just around the corner so make sure you are ready and when you are in the team make sure you take your chance'. "I've recalled Amari'i and Will because we are short of defenders." Meanwhile, striker Lee Novak has been cleared of a serious leg injury and could return to face Nottingham Forest on Saturday, 21 December. "He has badly bruised leg which we thought could have been a little fracture, so thankfully that is not the case," Clark said.